Grant Purpose: To support development and implementation of a new Student Career Preparation Workshop, designed to precede student entry into career training programs and improve education and employment outcomes. Montgomery College was founded in 1946 to provide high quality post-secondary educational opportunities at a reasonable cost. They are the largest undergraduate institution in Maryland and one of the most diverse community colleges in the nation. With more than 170 countries represented in the student body and no majority race, the College serves more than 60,000 credit and noncredit students annually at campuses in Germantown, Rockville, and Takoma Park/Silver Spring, with additional training centers in Gaithersburg and Wheaton. The College's Workforce Development & Continuing Education department offers a wide variety of programs, including English language skills and industry-specific certifications. Grant Purpose: To advocate for high-quality early care and education for low-income families in Montgomery County by engaging key stakeholders to create a call to action that will catalyze systems change to improve early care and education. 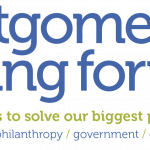 Montgomery Moving Forward was created in June 2013 and is a cross-sector initiative of leaders in Montgomery County who work to solve complex problems within the county. The first such issue they tackled through a collective impact approach was the workforce development system. Throughout the process, early care and education was continually raised as a critical issue that had to be addressed in order for the county to be successful in its workforce development reforms. Montgomery Moving Forward is a program of Nonprofit Montgomery. Grant Purpose: To support the Washington region’s participation in the implementation phase of Transforming the Workforce for Children Birth Through Age 8: A Unifying Foundation, an activity under the National Academy’s Innovation to Incubation Program. Through this effort, the Washington region will create an implementation plan for improving and supporting the early care and education workforce in a systemic way. The National Academy of Medicine (formerly the Institute of Medicine) is part of the National Academies of Sciences, Engineering, and Medicine. The three Academies work together, through independent and objective analysis, to solve complex problems and inform public policy decisions. The National Academy has a newly established Innovation to Incubation program, aimed at assisting individuals and institutions across the country implement projects based on reports published by the Academies. Grant Purpose: To support the T.E.A.C.H. Early Childhood DC program, which will invest in the professional development and improved quality of teachers serving children from birth through age five in the District of Columbia. For more than 40 years, NBCDI has engaged leaders, policymakers, professionals and parents around issues that directly impact Black children and their families, including early childhood education, health, child welfare, literacy and family engagement. With the support of their affiliate network across the country, the organization’s mission is to improve and advance the quality of life for Black children and their families through education and advocacy. Since October 2010, NBCDI has coordinated and distributed over 800 comprehensive higher education scholarships to teachers working in early care and education in the District of Columbia through the evidence-based, nationally-recognized T.E.A.C.H. Early Childhood program. Grant Purpose: To support the Capital Area Foreclosure Network, a joint initiative with the Metropolitan Washington Council of Governments, that supports housing counseling agencies in the region. The Nonprofit Roundtable is an alliance of over 300 nonprofits and community partners serving communities in Greater Washington who have a common vision to solve problems that no single organization can solve alone. The Capital Area Foreclosure Network (CAFN) is a joint initiative of the Nonprofit Roundtable and the Metropolitan Washington Council of Governments. CAFN brings together key stakeholders to combat the region's foreclosure crisis, including local governments, nonprofits, funders, and national institutions such as NeighborWorks America, the Federal Reserve Bank of Richmond, Fannie Mae and Freddie Mac. Grant Purpose: To support the educational attainment of low-income women in Northern Virginia, including both early care providers and mothers of young children, through the College Pathways Initiative’s two-generation work. Northern Virginia Community College (NVCC) is one of 23 colleges in the Virginia Community College System. Locally and nationally, the College is a leader in fostering relationships with community-based partners to better connect with and support the educational attainment of underserved students. NVCC’s College Pathway Initiatives include three program branches: 1) Pathway Connection serves students and their families in PK-11, 2) Pathway to the Baccalaureate serves traditional-aged students from grade 12 through completion of a bachelor’s degree, and 3) Adult Career Pathways serves the unique needs of non-traditional students. The two-generation approach within the College Pathways Initiative is a relatively new effort (launched in Fall 2012) to establish partnerships with local child care centers and home-based child care providers to support the post-secondary educational attainment of both lower-income staff and the parents of children in care. Grant Purpose: To support the Training Futures program, which will help low-income women complete education and training, and secure entry-level office or health care jobs. Northern Virginia Family Service's mission is to empower individuals and families to improve their quality of life and to promote community cooperation and support in responding to family needs. The organization provides services in five core areas: Workforce Development, Safe and Stable Housing, Child and Family Enrichment, Health Access, and Emergency Assistance. Training Futures, which has been part of the organization since 1996, provides job training for low-income and underemployed individuals to make the move from dead-end jobs or sporadic employment to stable, professional office careers which provide livable wages, benefits and opportunities for professional and personal advancement. A partnership with Northern Virginia Community College awards program graduates with college credit, and over 89% of graduates have secured full time employment in an office environment – making Training Futures a national model. Grant Purpose: To support Joining Voices, an advocacy project in Prince George’s County that empowers parents and child care providers to articulate the importance of quality child care for family stability, school readiness and economic growth, with a focus on sustaining and increasing funds for early care and education services. Prince George's Child Resource Center (PGCRC) helps create healthy and nurturing environments for children by supporting their families and educating their caregivers. Each year, PGCRC provides family support services to over 1,500 families and training to over 2,000 child care providers, parents and human services workers potentially touching the lives of nearly half a million children since 1990. The organization conducts home visits, provides child development education, links families to community services, and provides adult education. Grant Purpose: To support the Women’s Academic Success Advisory Committee to remove institutional barriers to college success for low-income women. Prince George's Community College serves a diverse population of more than 40,000 students who represent 103 countries throughout the world. The college offers more than 200 academic and workforce development and continuing education programs of study, and transfer and scholarship opportunities to four-year colleges and universities. Students can earn associate degrees, certificates, letters of recognition, and licensures. Among Prince George's County high school graduates who go on to college, 50% choose to attend the college. In 2012, the college created the Women’s Academic Success Advisory Committee (WASAC) and its cornerstone program, Women of Wisdom (WOW), to help support retention and completion rates among women students. Grant Purpose: To support year-two of a professional development pilot for pre-K teachers in the City of Alexandria. Evaluation will document the impact of different professional development models on teachers at different levels of development and proficiency. The Quality Collaborative is an initiative through which all of the publically funded preschool programs in the City of Alexandria are collaborating to create a best practice professional development pilot to support improved teaching in early childhood classrooms. Partners of the collaborative include: Alexandria City Public Schools, ALIVE!, Creative Play School, The Campagna Center, and The Child & Family Network Centers. ACT for Alexandria is the fiscal agent for this project. As a community foundation, the organization plays an important convening and leadership role in Alexandria and, as such, has helped to coordinate the city’s early care and education working group that is part of the City of Alexandria’s larger Children and Youth Master Plan and eventually launched the Quality Collaborative.